Every year after we've harvested our dried field corn, I turn the goats into the corn field. The girls get the morning shift, and then the boys get their turn in the afternoon. The goats love the change of diet and eat the corn leaves plus the weeds and grasses growing in between the corn stalks. This plus a handful of chopped oregano, rosemary, and okra pods every evening, and I'm getting 25% more milk! Everybody's a winner! Crabapples. Not terribly pretty but they're my first ever! gotten any of these since our 1st year here! Field corn. 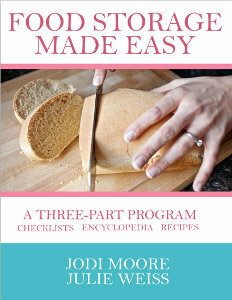 I love making our own corn meal. I'm very thankful for these once a year fruits of the earth! 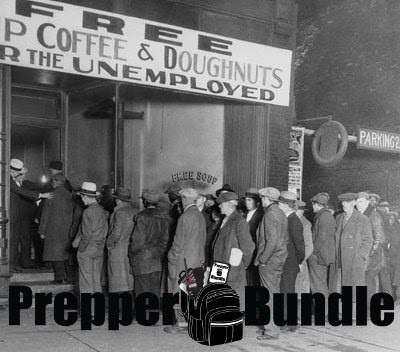 To most folks who regularly read my blog, preparedness probably makes sense. We have different reasons for doing so, and it's already made a difference for Dan and me. As things get more expensive, the government imposes more mandatory expenses, political and social discontent grows, and our income goes down, I can't help but have this feeling of inevitability. At some point in the future I'm going to be glad that we took the preparations that we have, and probably wish we'd done more. 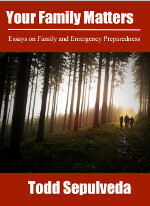 So why do some people not feel the need to prepare for whatever emergencies life sends our way? 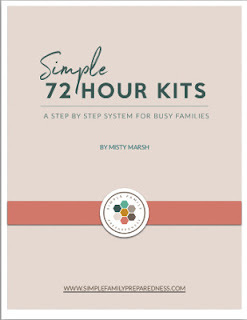 This collection of essays will give you a glimpse into why people don't prep and why they don't think it's necessary. It's an interesting look at real-life situations that the author and his family have experienced, situations that are common to all of us. Lots of meat here to make you think. 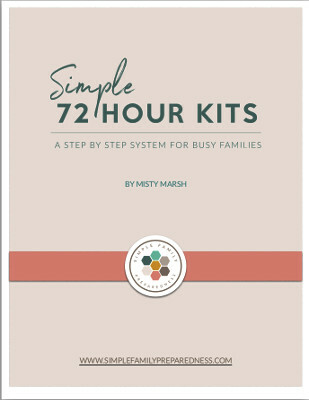 Also lots of practical advice and ideas here to prepare you and your family for problems ranging from common to uncommon. Here's another one that will make you think. 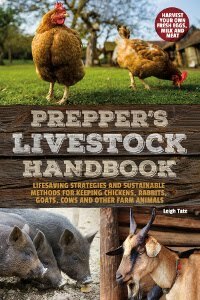 This book is not your typical prepper material, but it is an extremely interesting read. 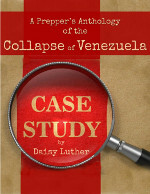 Venezuela's economic and political disaster did not happen overnight but over years. What makes this book so eye-opening is that Daisy has been able to sift through these events, compare them to similar problems in other countries, and formulate patterns. If you follow American news and politics, much of it will sound uncomfortably familiar. A must-read, especially for those who think it can't happen to us. 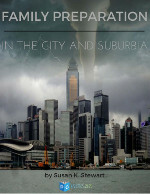 So what if you live in the city or a suburban neighborhood? What if you can't rely on growing all your own food and being self-reliant? This is the book is for you. It everything a suburban home or apartment dweller can prep for: water, heat, food, lighting, medical, money, entertainment, education, employment, protection, and community. Includes printable forms to help you with situation assessment, electricity assessment, and a document tracking system. Click on that link to choose a purchase option. 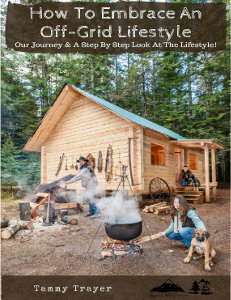 $69.97 for online access plus a flash drive containing this preparedness library. 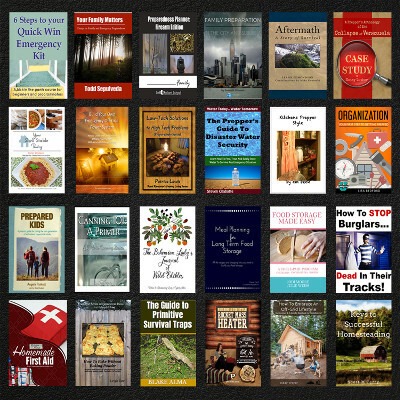 The PrepperBundle will be available until midnight Monday, Sept. 25. I always feel like I'm behind the power curve when it comes to the fall garden. 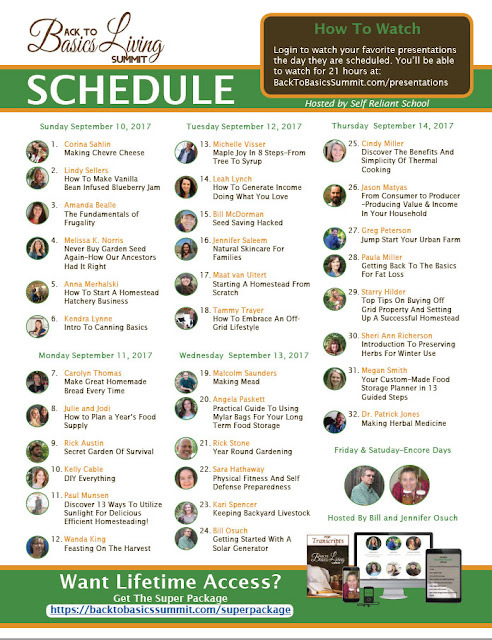 Our state cooperative extension says July and August are the months to plant fall crops, but July is too hot and August too busy with picking and preserving, so it seems that I'm usually doing my fall planting in September at the earliest. The garden has always been neglected during harvest months, however, so there is usually quite a bit of preliminary work to do before I can plant. I started with my no-show Swiss chard bed. I tried several plantings of chard this summer, but without success. I used my broadfork to loosen the soil to pull out the wiregrass. Broadfork for loosening soil for wiregrass removal. I like using my broadfork for this, because it's quieter and less disruptive than the tiller. It doesn't go quite as deep as the running wiregrass roots, but I'm able to loosen and pull out a lot of it. I planted sugar beets, lettuce, and radishes here. The popcorn just behind it will be ready soon too. Just above that (to the left in the above photo) are my sweet potatoes. Sweet potato vines look good, don't they? I'll harvest these some time next month. And above that is our one raised bed where I grew multiplier onions last winter. As an experiment to try and kill the wiregrass, I covered it all summer with a tarp. This worked quite well and the soil didn't require much work. Broccoli, Savoy cabbages, and collards. The plants came from the feed store. I never can resist a pretty display of packaged garden plants. The sprinkler pipe is hooked up to one of our rainwater overflow tanks. overflow from our large rainwater catchment tank. After the plants were in, I seeded the rest of the bed with white Dutch clover. The clover will be a living mulch this winter. 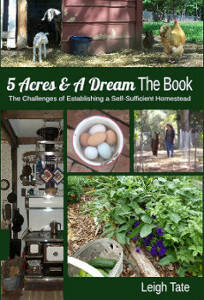 Early this spring I did my first experiment with clover in the garden as living mulch. You may recall that I put in a swale at the top of the garden on one side and pulled out three wheelbarrow loads of wiregrass in the process. I'd noticed that wire grass (Bermudagrass, actually) prefers full sun and doesn't grow well in other plants' shade. I wanted to see how well a living mulch would work to keep the wiregrass at bay. Clover, wiregrass, and cushaw vines. It worked fairly well, except that Bermuda is a warm weather grass while clover is a cool weather legume. When the clover went dormant for the summer, the wiregrass took advantage. The clover is coming back in patches now, but wiregrass dominates whatever area its in, so I don't expect the clover to push it back. In the midst of the clover and wiregrass are cushaw winter squash. They were planted late so I won't get as many as I'd like, but each one is large, and they are great keepers. I use cushaw instead of pumpkin for pumpkin pie and other pumpkin goodies. I also cleaned out the hoop house. After I let last year's winter veggies go to seed for collecting, I did all my summer planting outside, so the hoop house has been neglected all summer. There was a lot of unwanted growth there that had to be pulled. but that will have to wait. Work on the barn takes priority. I did make one exciting discovery in there. Do you remember that I planted garlic bulbils in one of the hoop house beds last year? Well, they made it! Baby garlic plants, planted about a year ago. They started well and then this poor little box became so overgrown with weeds that I gave up hope for the baby garlic plants. But even after a summer of neglect, they made it! Speaking of garlic, I also turned one of this summer's green bean rows into a garlic bed. The green beans were where I made my double-dug swale rows, so little preparation was required there, except that they had sunken a bit so I added finished compost from the chicken-compost piles. The second double-dug row is for multiplier onions this year. I like the multiplier onions because they do so much better for me than globe onions. Plus, they reproduce themselves so I don't have to buy onion sets every year! One last photo - this year's winter wheat. We actually got this planted at the end of August, which was perfect! It's spotty but doing well. I'm still harvesting okra, tomatoes, and an occasional cucumber. Still to plant: turnips, carrots, beets, parsnips, kale, mustard greens, and more salad greens. At least I've gotten quite a bit in before October. 👏 For me that's pretty good. How about you? Are you working on your garden too? In my last barn blog post, I showed you the ladder Dan built for the hayloft. The next step was to begin working on the hay loft itself. What the barn looked like at the end of my last barn blog post. The plan for the loft is five-foot walls, a gable roof, and a loading door in the front with a block and tackle to hoist up the hay. It's being build with all home-milled lumber. the right, my feed & milking room will be on the left. After Dan relocated the sawmill, he cut the ridge beam. The beam measures 3.5 in. by 7.5 in. by 18.5 ft.
Notice the straps tying down the ridge beam? It had already been secured, but Dan got this up right before the remnants of Hurricane Irma were forecast to hit us. We were expected to receive 40+ mile per hour winds, and we got them. Lots of branches down in the yard and a number more trees down in the woods, but the ridge beam stayed put! roof off the back will cover the remaining third. How it looks now from the front. I'm happy with the progress, but Dan wishes it was further along. It won't be done before winter, but he'd like to get the roof on before the fall rains start. 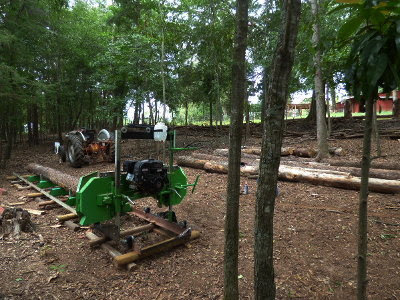 Dan's sawmill has a new home. Yes, we still have it, but it's been stationed in our driveway since he bought it last spring. 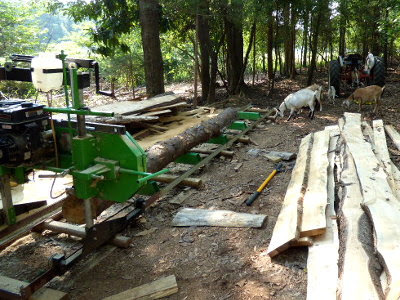 There's enough room behind the house to accommodate the sawmill plus our vehicles, but it's still been somewhat in the way when Dan is working on lumber. 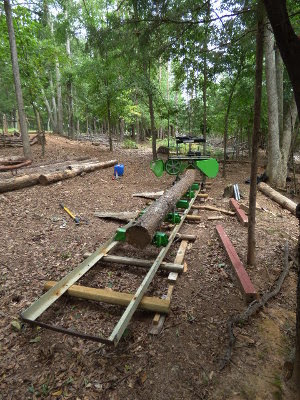 Because all our trees come from down in our woods, it seemed like a good idea to relocate the sawmill closer to the source. It's new home is the doe browse. Here it is in its new home (labeled "browse #2 on our Master Plan). I admit it's not much of a browse anymore. First the goats took out all the greenery they wanted, and then Dan had to deal with numerous fallen pine trees. The oldest trees in our woods are pines, a pioneer species. We've had a lot of them fall, often smashing fences like above. trees are being used for timbers and lumber for the barn. and my branch and debris clean-up, we've pretty much cleared the browse out. Because of that, it seemed like a good place to set up the sawmill. It will be easier to transport the finished lumber rather than whole logs. Eventually we'll have all the pines pretty much cleared out. In fact, heavy rain and wind from Irma are forecast to hit us today, so we may find a lot more downed trees once the storm passes through. The browse is already sunnier in the places the pines have fallen or Dan has taken them out. In those areas the young hardwoods are beginning to branch out and thrive. Goat snoopervision. Planks on the right are for the hayloft. Eventually the browse will become silvopasture, although that's likely a few years down the road.